All transactions are safe and secure with a reliable history in online purchasing behind each of our associates. 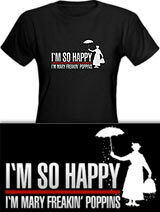 Buy the I'm So Happy I'm Mary Freakin' Poppins t-shirt to own Grey's Anatomy clothing and merchandise. The front of these tees feature Dr. Miranda Bailey's funny Grey's Anatomy quote, "I'm so happy I'm Mary Freakin' Poppins." Miranda (Chandra Wilson) says this as she's trying to get through to her whiny interns, "You know what will make me look happy? Having the code team staffed, having the trauma pages answered, having the weekend labs delivered and having someone down in the pit doing the sutures. No-one holds a scalpel until I'm so happy I'm Mary Freakin' Poppins." These popular Grey's Anatomy tees appeal to even the most passive fan. In addition to the I'm So Happy I'm Mary Freakin' Poppins tee above, browse the Grey's Anatomy Clothing Gallery for more apparel like men's and women's clothes, kids shirts or hoodies.